All of this is fresh in my mind as I just completed four weeks of summer camp teaching maker education and photo-video apps to 5 to 10 year olds. This teaching experience reinforced for me that educators can be tour guides of learning possibilities; showing learners the possibilities, then getting out of the way. The following section describes some of the conditions in the learning environment that support the educator as being the tour guide of learning possibilities and then handing over the responsibility for learning to the learners. Educators still take on a very active role in the learning environment, but learning is driven by the actions of the learners not those of the educator. In a learning environment that stresses self-directed learning, the educator conveys the attitude that learners are capable of being masters of their own learning. In line with showing learners the possibilities and getting out of the way, the educator needs to take a back seat role in the learning process. Learners may not, often will not, do things the way the educator might, but the educator respects and supports this process in a self-determined learning environment. If educators want to know how learners learn, then they need to observe them learning under their on terms, with tools and techniques they use naturally. Too often adults assume they know how children and young people learn, and too often they do not especially in this new age of learning. The educator in the role of tour guide of learning possibilities first, observes to discover each learner’s unique way of interacting with the world, and second, based on these observations, suggests or offers resources and strategies to further each learner’s self-directed learning process. The educator as a resource means that the educator becomes a coach or a mentor. Educators are the adult experts in the room. Learners will often go to the educator for assistance especially when stuck on a problem or to get feedback. The best coaches encourage young people to work hard, keep going when it would be easier to stop, risk making potentially painful errors, try again when they stumble, and learn to love [their learning] (One to Grow On / Every Teacher a Coach). The educator as a resource implies that the s/he has multiple skill sets: expertise in the process of learning and expertise in how to navigate online environments along with the ability to mentor learners using these skill sets. A subtitle of this section is It Really Is About the Technology . . . Sort of. In order for learner agency and self-directed learning to occur, educators need to keep abreast of current and emerging technologies. There is an assumption that young people are digitally savvy and know how to use emerging technology. The widely-held assumption that all young people are digitally literate and able to navigate the internet meaningfully is inaccurate. This is something we urgently need to address if we are to support young people to cope with – and contribute to – a complex, global and digital society (New report challenges the assumption that all young people are digitally savvy). “If educators are serious about preparing learners for their real lives – current and future, then it becomes an ethical imperative to bring relevant, current, and emerging technologies into the learning environment (It really is about the technology and . . .). This translates into showing learners the possibilities of technology and internet use for learning so the learners can then bring this knowledge into their own learning journeys. It has been said that learning is painful. I take issue with that phrase. When learning occurs in settings and with processes selected by the learner, it is natural, fun, playful, and joyful. Sure, there are struggles as new learning develops, but it becomes a natural, accepted part of the process. The highest-level executive thinking, making connections, and “aha” moments of insight and creative innovation are more likely to occur in an atmosphere of what Alfie Kohn calls exuberant discovery, where students of all ages retain that kindergarten enthusiasm of embracing each day with the joy of learning. Joy and enthusiasm are absolutely essential for learning to happen — literally, scientifically, as a matter of fact and research (The Neuroscience Behind Stress and Learning). The learning environment in a setting embracing self-directed learning takes on the characteristics of free range learning resulting in learners constructing their own meanings from their learning endeavors. Free Range Learning is learning by living. It is learning by following our passions, exploring our world, living inquisitive lives and thinking freely. It is a lifestyle based on trust of a child’s natural desire to learn about the world around them. Every person’s learning journey will develop based upon their interests, experiences and choices (What is Free Range Learning?). Free range learning is often associated with unschooling or homeschooling but it is intimately related to self-directed learning; and its tenets can be brought into in a more formal learning environment. The result is an honoring of contructivist learning “which holds that learners ultimately construct their own knowledge that then resides within them, so that each person’s knowledge is as unique as they are” (Learning Theories and Transfer of Learning). Emergent learning is unpredictable but retrospectively coherent, we cannot determine in advance what will happen, but we can make sense of it after the event. It’s not disordered; the order is just not predictable (Emergent Learning and Learning Ecologies in Web 2.0). Ambiguity is accepted. The educator lets go of what types of learning and products should result. By letting go of expectations “what should be”, there is an opening up to all kinds of emergent learning possibilities. I have learned that if you give freedom and trust to students, they will find their own way to the learning that matters the most. Playing it safe is not going to yield the opportunities that will make a difference. Off-script is when you don’t quite know where you are going, but you have the courage to commit to the journey knowing that it is the process itself that will hold the worth (Speculative Design for Emergent Learning: Taking Risks). In this age of information and technology abundance, free online technologies and resources are just ripe for the picking. An advantage of open educational resources is “expanded access to learning. Students anywhere in the world can access OERs at any time, and they can access the material repeatedly” (Pros and Cons of Using OERs for Instruction). These resources leverage the playing field. They are available to all learners regardless of geographic location and SES level (although access to the Internet is required). This translates in the availability of high quality tools and resources outside of the more formal educational setting. Learners can access them in informal learning environments such as at home or local coffee shops and/or via their mobile devices in order to continue and extend their self-directed learning. Technology Skills: I can use technology to help me learn. Creativity and Inventiveness: I can create new & worthwhile ideas & things. Risk-Taking: I am willing to try new things when I am learning. Academic Mindset: I am a good and powerful learner. Communication: I can communicate clearly both verbally & in writing. Curiosity and a Sense of Wonder: I wonder about the world around me. Connected Learning: I can network with others to help with my learning. Self-Directed Learning: I know how to learn new things on my own. Self-Motivation: I can motivate myself to learn new things. A child’s world is fresh and new and beautiful, full or wonder and excitement. It is our misfortune that for most of us that clear-eyed vision, that true instinct for what is beautiful and awe-inspiring, is dimmed and even lost before we reach adulthood. If I had influence with the good fairy who is supposed to preside over the christening of all children I should ask that her gift to each child in the world be a sense of wonder so indestructible that it would last throughout life, as an unfailing antidote against the boredom and disenchantments of later years, the sterile preoccupation with things artificial, the alienation from the sources of our strength. What is needed more than ever is to inspire our students to wonder, to nurture their appetite for curiosity, exploration, and contemplation, to help them attain an insatiable appetite to ask and pursue big, authentic, and relevant questions, so that they can harness and leverage the bounty of possibility all around us and rediscover the “end” or purpose of wonder, and stave off the historical end of wonder. The story in his video reminded me of a day I was substituting for a 2nd grade class. It had begun to snow as we arrived to school that morning. By mid-morning, a few inches covered the ground. It was time for recess but, as expected, a voice came over the intercom to state that recess would be inside within each teacher’s classroom. I heard the kids moan as they came to school dressed for snow with boots and winter jackets. I threw caution into the wind. I asked the kids to bundle up so we could go outside. The kids became . . . well, kids. They ran through the fresh snow looking back at the footprints they created. When one found something of interest, they called the others over to see. They caught snow flakes with their tongues and made snow angles in the snow. There were no conflicts nor arguing as was common to this group of kids. They just ran, played, and laughed together as a unified group reminding me of a flock of geese. I watched them with a tear in my eye, one that reflected the beauty I was witnessing. We all experienced a sense of wonder and play that day. Wonder can’t be planned nor scripted. Wonder rarely occurs as educators plow through pre-established, scripted curriculum, worksheets, and test preparation. I want to create the conditions for my students of all ages to have their eyes opened with and to wonder; their mouths open to say “wow”, and their hearts open to say this feels so very good. Have we created a trillion-dollar, multimillion-student, sixteen-year schooling cycle to take our best and our brightest and snuff out their dreams—sometimes when they’re so nascent that they haven’t even been articulated? Is the product of our massive schooling industry an endless legion of assistants? The century of dream-snuffing has to end. The real shortage we face is dreams, and the wherewithal and the will to make them come true. We’re facing a significant emergency, one that’s not just economic but cultural as well. The time to act is right now, and the person to do it is you. I propose that educators take a proactive stance to move from a system that may steal kids’ dreams to one that promotes the actualization of learner dreams. I have a dream today and everyday that education can become a conduit through which learners are provided with the time, knowledge, strategies, and tools to make their own dreams come true. We are living in an era that education can be passion-based and dream-driven. In this context, the role of the educator becomes that of dream-facilitator. Given no restrictions, what would you like to do in your spare time? If you could wave a magic wand and be or do anything you want, what would it be? In one year from now, 10 years from now, what would you like to be doing that would make you happy? What would your life be like if it were perfect? Learners can be provided with a choice with how they answer theses questions: verbal or written responses, video or audio recording, or a drawing. An extension of this activity might be asking learners to create a vision board (see Vision Boards for Kids and Visions & Values for Kids). Technology could be used for this process by giving students the opportunity to create a Glog or an Animoto of images that symbolizes their dreams. Support systems or personal learning networks could then be established based on grouping learners with similar dreams. The group would act as cheerleaders, support-providers, progress-checkers, and resource providers for one another. One of the group’s learning activities could focus on expanding their personal learning networks to include folks with similar dreams who they locate via social networks like Twitter, Tumblr, Facebook, and other social networks. Dreams will only come try if actions are taken to achieve them. As such, the educator should facilitate a method for learners to reflect on progress towards their dreams. What did you do today, this week to achieve your dreams? 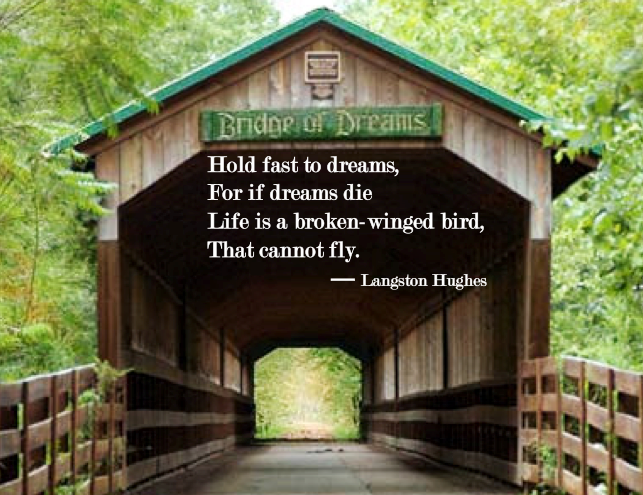 What obstacles are you having or foresee having in progress towards your dream? How can you overcome your obstacles? What resources did you locate that can help you fulfill your dreams? Blogging or micro-blogging (e.g. Twitter) could be used for this reflective process. My parting shot to my pre-service teachers as they enter the world of teaching is to always remember why they became teachers in the first place. I encourage them to ask themselves each day of teaching, “What did I do today to leave a positive legacy for and with my learners?” I propose that all educators should regularly ask themselves this question. I believe that by facilitating dream-driven education, they will have a positive response to this question. User-Generated Education: Student-Centric Education? Flipped Classroom? Google 20% Day? I am in the process of designing and teaching a graduate course on Social Networked Learning. For the third module, the educators in the course are to go out and seek their own professional development opportunities based on their own grade level and content area interests. This prompted me to revisit my ideas surrounding user-generated education – the inspiration for and title of this blog. A few years ago, I facilitated a conversation about user-generated education for EduCon. It was fueled by the idea that this era of learning in the 21st century should be student-centric and user-generated. An extensive list of videos, articles, and text resources on this topic can be found at http://jackiegerstein.wikispaces.com/User-Generated+Education. This Educon conversation originated from my confusion as to why public school education is still be driven by educational essentialism when knowledge is in abundance via the Internet and when educators are no longer the gatekeepers of knowledge. Mimi Ito and others have described, in their research, how young people are getting online to connect and find others with similar interests, how they seem to be learning more in their informal learning environments than in their more formal school environments. The urgent need to reimagine education grows clearer by the day. Research has shown that too many students are disengaged and alienated from school, and see little or no purpose to their education. Business leaders say there is a widening gap between the skills of the workforce and the needs of businesses seeking competitive advantage. Additionally, technology and the networked era threatens to stretch the already-wide equity gap in education unless there is decisive intervention and a strong public agenda (http://connectedlearning.tv/connected-learning-principles). The major purpose of school, most would agree, is to learn. As such and given the rich array of resources available via networked learning, the time is ripe for a student-centric, progressive education. Some educators have proposed addressing this gap with Google 20% Projects and FedEx Days at school. But school is not/should not be work (aka employment). The Google Rule should be turned on its head with 80% of the time students pursuing their own interests and passions with educators acting in the role of mentors, facilitators and coaches. 20% of the other time could be spent engaging in a liberal arts education. Given this 80% time to pursue their passions, learners could have the opportunity to become experts in their areas of interests/fields; finding resources, web links, and videos; remixing and mashing them up to gain a personal and deep meaning; and then sharing their resources, findings, and projects with their classmates. So many “needs” would be met . . .
Students would learn the process of how to learn, how to find reputable resources, how to report their findings. Students would find their tribes. Students in their face-to-face learning environments would learn about the diversity of other student interests, possibly finding new passions and interests in the process. Effective and progressive educators understand and attempt to implement PBL strategies and practices within their learning settings. What is PBL? Project-Based Learning? Passion-Based Learning? Play-Based Learning? I contend that education, not necessarily schooling, when done “right” is all of these. How can project-based learning not include elements of passion and play? Doesn’t play connect one to his or her passions? 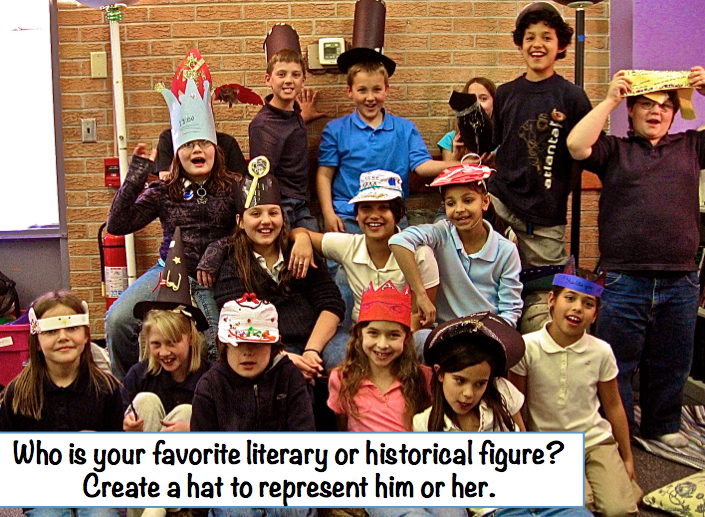 Shouldn’t passion-based learning include the development of playful projects? Here is a curated Scoop.It of Project-Based Learning Resources: http://www.scoop.it/t/project-based-learning. Today knowledge is everywhere – it’s easily accessible. With a couple clicks of the button, I can find content beyond my ability to absorb it in a lifetime. As a young person today, I can learn anything I want to learn at any time I want to learn it. Therefore, instead of focusing so much of our effort on the content, we really need to focus on helping them learn. We must help students understand how to synthesize and analyze and to create – to think deeply and become passionate learners. Play and its related benefits are not just for children. Stuart Brown discusses Why Play is Important, No Matter Your Age is his TED talk. Caine and his Arcade have been given a lot of attention and press lately. Rightfully so. It is a great example of PBL – Project, Passion, Play Based Learning. I discuss it in more depth in 9 Year Old Boy’s Arcade Creation: An Example of Passion-Based Learning. Integrating projects, passions, and play into education in this era of learning has become a moral imperative, in my perspective. We often ask students to spend 8 or more hours of their day in the pursuit of education. Through my experiences as a student, I feel that the education system stole time in my life making me do things for which I had no interest, desire, nor use. As such, I am in a lifelong quest not to do the same to the children who are participating in our current systems. Students are grouped by age and typically similar cultural demographics as they are from the same neighborhoods. Students are told what to learn, when to learn it, and how to learn it. The topics to be covered, standards to be achieved, and curriculum to learn are mostly determined by the government. Textbooks and testing instruments are written by a few individuals who decide what is important to learn and know. Corporations decide which textbooks and testing instruments to highlight and disseminate. Conformity is rewarded, diversity of thoughts and opinions is not. 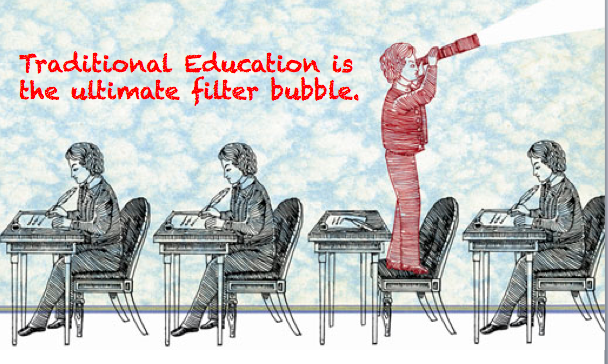 Students who do not fit into the filter bubble are failed, asked to leave the system, or quit.